Palmdale School District members hold a groundbreaking ceremony for Dos Caminos School Wednesday. PALMDALE – Construction is underway for Dos Caminos School set to be complete August 2012 in Palmdale. The school will provide a dual immersion education program for up to 480 students, said Dos Caminos School Principal Marlene Calcines. “We are absolutely ecstatic that we’ve opened another dual immersion program,” Calcines said. The dual immersion program is an idea Palmdale School District Superintendent Roger Gallizzi said he came up with in 1997. “We have always had bilingual programs since the early 80’s,” Gallizzi said. The original program was for Spanish speakers to learn English, he said. This new program is better because now English and Spanish speakers are learning both languages, Gallizzi added. Al Tsai, director of maintenance and operations, said Dos Amigos (”two paths”) is a west side version of the current Los Amigos School. Construction for Dos Caminos School is on going. The school is set to be complete August 2012. A Foreign Language Assistance Program (FLAP) grant provided $6.6 million for the school, said Calcines. A capital facilities fund provided $1.6 million for construction, Tsai said. They will be using pre-fabricated materials, which will be quick to install. 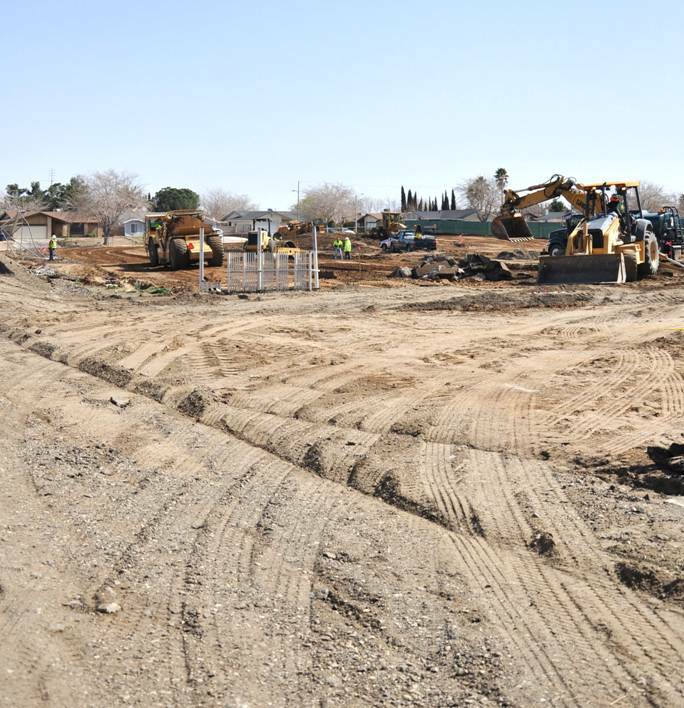 When construction is completed, Dos Caminos School will have four buildings for grades K-3, as well as an administration building, Calcines said. The buildings are set up to have four classrooms each, with a workspace between all the classes, she said. The classrooms will be completely kid-friendly by placing the teacher’s desks in the workspace. Eventually, Tsai said, the Dos Caminos School will move to Juniper Intermediate to become a K – 8 school, while the Juniper Intermediate School will be relocated. The Ocotillo lower school is very congested, Tsai said, so they will move their Pre-K Special Education and Autism students to the Dos Caminos campus. “There’s going to be a lot of shifting,” Tsai said. He added that the best case scenario would be to have all the relocation done by September 2014, but they can delay completion up to a year. The layout of the buildings will also provide a great space for autism students because the workspace will create a clutter free environment, said Gallizzi. It will also allow teachers to collaborate in the workspace, he said. 1 comment for "Dos Caminos School holds groundbreaking ceremony"
Omg,.this so pisss me off, their is no frigging money four the small wilsona school distract, they build a brand new school, and never had the chance to open it, wtf……but building a bilingual schoool in palmdale, and opening it 2013, is crap, what outrage, take care if the frigging schools, and programs you have cut, before building more schools out here, one pissed off parent!